By now, I think I’ve read just about every kind of futuristic dystopian scenario that a young adult novelist can dream up, so I was just glad that The Last Girl did not involve any sort of gladiatorial teen tournament imposed by a cruel government. Still, following in the footsteps of classics like The Handmaid’s Tale gives you some pretty big shoes to fill (pardon the mixed metaphor). Does this new, woman-centric apocalypse adventure add something new to the conversation? The plot: 25 years ago, some sort of global epidemic reduced the birthrate of female babies to less than 1 percent. A generation later, no cure has been found, and there are fewer than 1,000 fertile women left in the entire world. 20-year-old Zoey and a handful of other girls have spent their entire lives in a heavily guarded research compound that is researching a cure. They’re told that the virus destroyed nearly the entire human race and that they are a vital part of rebuilding humanity. But Zoey is getting suspicious about the final procedure that happens to each young woman when they turn 21… and are never seen again. Convinced that there’s something sinister going on (duh), she comes up with a desperate plan to escape. But even if she makes her way to freedom, what kind of life is awaiting her on the outside? I feel like I’ve read this story way too many times before. Feisty heroine who dares to question the authoritarian regime, check. Useless sidekicks who exist to show the heroine’s compassionate side and slow down the plot, check. Bland, crystal-eyed love interest who’s torn between duty and passion, check. Smuggled books as tools of resistance and revolution, check. Of course, you generally have to cut dystopian novels some slack for their unlikely premises, but there’s too much that doesn’t make sense in this story. In a society that’s down to a handful of rare fertile women, why would they physically and mentally abuse these incredibly valuable living resources? How does a teenager who was raised to be physically passive and intellectually incurious suddenly become a weapons expert, escape artist, and super-tough badass? And naturally it’s book 1 of a forthcoming, bloated trilogy, which means there won’t be any answers for a long time. I’m willing to stick with a multi-volume story if there’s enough plot to justify it. But the world-building and character development that lays the foundation for a solid series just isn’t here — and Zoey herself is such a blank slate that I’m pretty indifferent to her fate. 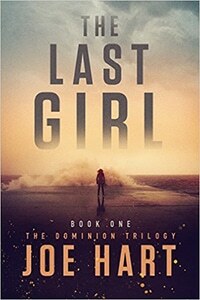 The Last Girl could be good for mindless, fluffy entertainment if you don’t think too hard about the inconsistencies and stereotypical characters… but if the end of the world is really this close, I don’t have time to read mediocre books.